Lanín is an ice-clad, cone-shaped stratovolcano on the border of Argentina and Chile. It forms part of two national parks: Lanín in Argentina and Villarrica in Chile. It is a symbol of the Argentine province of Neuquén, being part of its flag and its anthem. Although the date of its last eruption is not known, it is estimated to have occurred within the last 10,000 years. Following the 1906 Valparaíso earthquake a local newspaper reported the volcano to have erupted, however in a work published in 1917 by Karl Sapper claims the news was disputed. 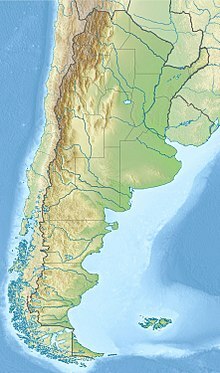 The ascent is regulated by the management of Argentine National Parks and the Argentine National Gendarmerie, and is technically relatively simple but has however a much higher level of exposure than the neighbouring volcanoes. The nearest towns, usually employed as a base for climbers, are Pucón in Chile and Junín de los Andes in Argentina. There are two paths to the summit: one on the north, starting at 1,200 metres above mean sea level near Tromen Lake and the international Mamuil Malal Pass, accessible via Neuquén's Provincial Route 60; and one on the south, starting beside Huechulafquen Lake, accessible via Provincial Route 61. Lanín lies at the Atlantic-Pacific water divide of the Andes, being for that reason located in the Argentina-Chile border according to the 1881 border treaty between these countries. To the north and south lies the Tromen and Paimun Lakes respectively. Lanín is the easternmost volcano of a north-west south-east oriented chain of 3 large stratovolcanoes volcanoes, Villarrica being the westernmost volcano and Quetrupillán the one in the middle. This alignment is attributed to the existence a fault beneath the volcanoes. In historical times Lanín has been the least active of these volcanoes. Apart from Quetrupillán and Villarrica there a number of old eroded remains of stratovolcanoes in the alignment. The volcano itself lies rests above a basement of gneisses, felsic plutons and volcaniclastic sequences. The basement rocks constitute a tectonically elevated block limited in the west by the north-south Reigolil-Pirihueico Fault. Ages of ranging from Late Pliocene to Early Pleistocene have been suggested for the oldest known parts of the volcano which are dacitic lava flows with columnar joints. Basalt is the most common rock of the volcano. Lanín shows overall higher alkali (Na2O plus K2O) to silica ratio than Villarrica, which is interpreted as reflecting a lesser degree of partial melting underneath the volcano and showing that the volcanoes of the chain have distinct source regions in Earth's mantle. Another petrologic characteristic of Lanín is its bimodal volcanism. ^ a b c "Lanín". Global Volcanism Program. Smithsonian Institution. Retrieved 2006-12-14. ^ "Argentina and Chile, Central - Ultra Prominences" Peaklist.org. Retrieved 2013-05-02. ^ a b Luis E. Lara, José A. Naranjo and Hugo Moreno, 2004. Lanín volcano (39.5°S), Southern Andes: geology and morphostructural evolution, Revista geológica de Chile vol. 31. Wikimedia Commons has media related to Volcan Lanín. La estrella del Parque: el Volcán Lanín - San Martín de los Andes municipal website.